The AL030 Power Tote makes it quick and easy to transport your manual folding wheelchair. 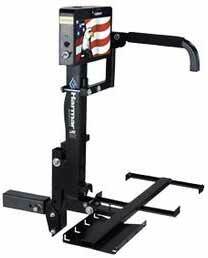 This lightweight lift features a 100 pound lifting capacity and will mount on a standard Class I, II or III hitch. The AL030, like the AL003 is equipped with an adjustable hold-down arm and can fold when not in use. The optional swing away mount allows easy access to the trunk of a car or the rear doors of a van.